You won't find Kauzmann Trail in any travel books or promotional material. There are no fancy, professional helicopter photos in Calendars or on billboards. In all honesty, you probably won't find Kauzmann Trail at all. 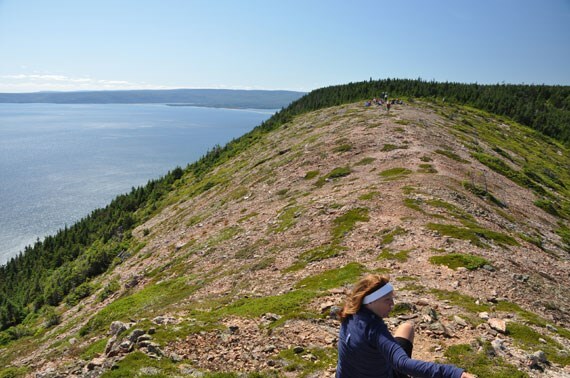 But if you do, and walk the 2km flat trail to the end of the earth that is Money Point, you will find a view that rivals the Skyline Trail, with only one difference. You will find it alone, because only a handful of people know the Kauzmann Trail exists. 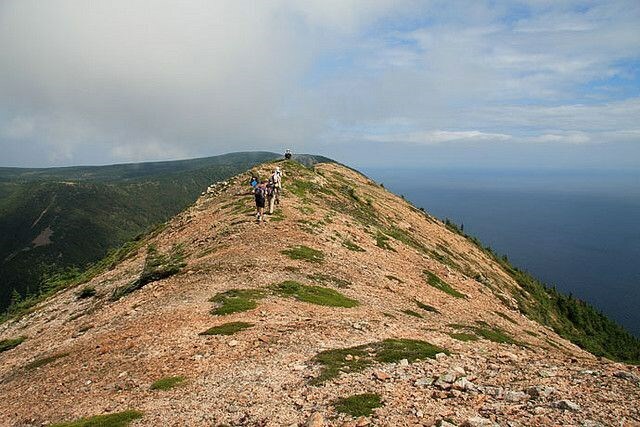 The Kauzmann Trail is located on the Northeastern most protrusion of Cape Breton Island I like to refer to as "Cape Breton's Horn". It is a fair bit east of Bay Saint Lawrence, down the 6014, a dirt road people regularly question the purpose of. The trail entrance has no official markings, and could be just as easily mistaken for a deer path or a fisherman's trail. The trail is 2km long, and remains flat for the majority or the time. As far as difficulty goes, you could hike this trail at 65, but I don't recommend you wait that long. The first 1.5km feels much the same as any Cape Breton walk in the woods, until you reach the spur. There, you find yourself 1000 feet above the sea to your right, and 1000 feet above a gorge on your left. It is advised that you stay in the middle. I did not find this trail. My brother did when he was geocaching in the Highlands. There is a small ammo box at the peak of the peninsula where you can sign your name to let the world know you've been there. He visited two years in a row, and the last name in the ledger was his. And here's a video of two very excited guys finding it. If you find yourself with some free time this Summer, and looking for something a bit different, go find the Kauzmann. You won't regret it. And I expect to see some more names in that ledger on my next visit. 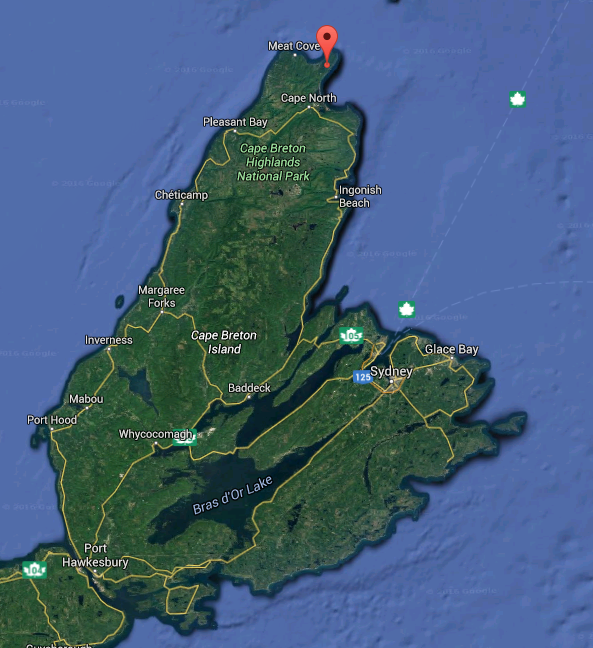 Posted by Rory Andrews on goCapeBreton.com where you can find and share everything about your local community. Find the end of the earth. The dirt road mentioned in the article is used for access to the cell tower and coast guard tower at the end of the road.I travelled this many times and often wondered why the cars were parked at this path. I must check it out.also if u go to the end of the road by the tower u can see st, pauls island,lots of history there ,,,google it. My family and I did this trail yesterday. Road 6014 is approximately 8 miles on Bay St. Laurence road from the Cabot Trail turn off and can easily be found by looking for a brightly colored "Jumping Mouse Camping 4 km ahead" sign located a the intersection of Bay St. Laurence road and Road 6014. Also, the trail entrance is 3.4 miles from this intersection for those who can't convert kilometers. Road is washed out in spots and some rather large rocks in road at places, but passable for a regular car. Bear poop on the trail so be aware. As promised the view is spectacular after a flat 2k walk out to the coast. It is a beautiful spot. We hiked this trail last weekend. Pictures and words do not do justice. You have to walk out on that spur to get the exhilarating feeling . It is the most spectacular trail I have ever been on, anywhere. Thanks for the notification. 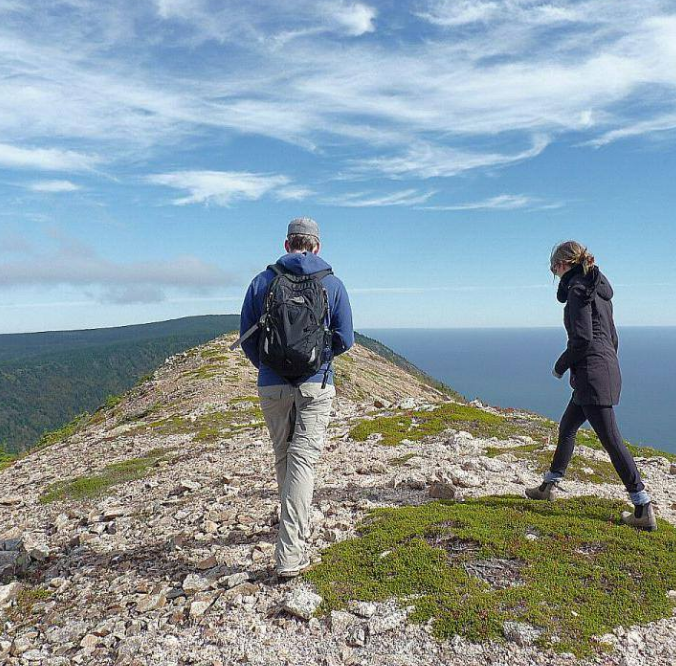 Will be in Cape Breton next week and hope to do this trail.... provided Hurricane Jose doesn't threaten to blow us off the top. Looking at these google coordinates in google maps on my phone, there is a spot marked Rassmussen/McLaughlin Trailhead pretty much right at this spot. Is this the same as the Kauzmann Trail or are they two different trails? The information contained in this post, and the various comments below. needs updating. What doesn't need updating is the fact that this no-longer-secret trail gets you to one stupendous view. 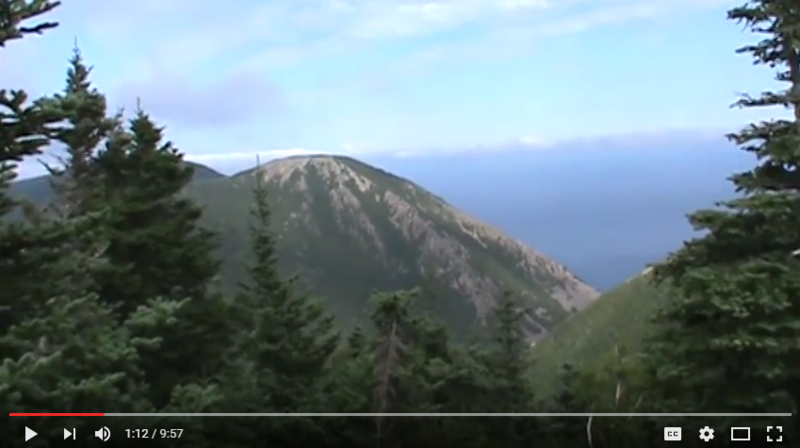 I hiked this trail on Monday Aug 12 with 2 friends around noon-time. First of all, Road 6014 currently has no sign marking it. But it is easily identifiable because it used by huge and fast-moving gravel trucks coming from the quarry up the road, and this is obvious from the gravel that spills out onto the main highway. There is currently no sign near the entrance to Road 6014 that advertises the Jumping Mouse Camping Grounds. The road to the quarry is quite well maintained because of the quarry traffic (be very careful of those fast-moving trucks, though). The road beyond the quarry and on to the communications towers is also quite good, though maybe not that great for very low-slung cars. The entrance to the Kauzman trail has a very nice sign now saying "Kauzman Trail" (and red blazes, but no blue ones). So whatever the "real name" is, that's what the sign says. We were also told in St Margaret's village that it is also called "Dave's Trail", after Dave Rasmussen, who pioneered the trail and still maintains it (and deserves a medal). So there is definitely a valid reason for calling it the "Rasmussen-McLaughlin" trail, as has been mentioned elsewhere. The communications towers in the area mean that there is a very strong cellphone signal :) For those whose life depends on GPS/Google Maps, btw, punching in "Kauzman Trail" will get you there in good shape. So much for the "secret trail" :) On Monday we did not go out very far along the ridge as the wind had come up and we had concerns about falling/slipping/rolling 300m down to the sea. Definitely want to try it again without the wind -- perhaps early morning? Lots of berries, btw, this time of year.